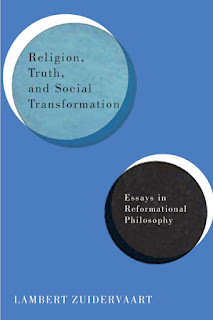 When I saw the chapter list of Lambert Zuidervaart’s new book Religion, Truth, and Social Transformation: Essays in Reformational Philosophy (2016), there was no doubt that I would comment on his essay "Macrostructures and Societal Principles: An Architectonic Critique." This is because it contains what seem to be the blueprints for the future of critical theory. By this I mean Zuidervaart has provided us with an infrastructure—and I deliberately use concepts borrowed from construction, since what Zuidervaart is offering us is succinctly put forth as an architectonic critique of macrostructures. In the following passages I will give an overview of what I perceive to be the novelty of Zuidervaart’s theory and show how it tackles the relevant problems of current social philosophy. If we take Adorno, Horkheimer, and Marcuse as the main representatives of the first generation of the Frankfurt School, then their insistence on the prevalence of instrumental reason, identity thinking, the totally administered society and the one-dimensional man will without doubt lead the social theorist into an abyss of cultural pessimism, and even worse into a sense of apathy about the possibility of practical action. However, much has changed since the time in which these wonderful thinkers worked out their thoughts and theories: true, some things remain the same, but others only got worse. Current social theories in the tradition of the Frankfurt School have moved on from the negative and pessimistic rendition of society that the first generation held steadfast. However, they lack the core ingredient that gave a particular flavor to the Frankfurt School’s social theory—that of the emancipation of society and people. Following this tradition, I believe that Zuidervaart’s social theory—explored in the above-mentioned essay—does justice to the aroma of the Frankfurt School (negative dialectics as the starting point for critical thinking), and the notion of emancipation from oppression. I hope to touch on several aspects of Zuidervaart’s essay and show why I think we must proceed and elaborate on the structures he provides. Zuidervaart’s social theory engages with Adorno’s famous articulation of the relation between theory and praxis in the opening of Negative Dialectics (1966), namely that “[p]hilosophy, which once seemed obsolete, lives on because the moment to realize it was missed. The summary judgment that it had merely interpreted the world, that resignation in the face of reality had crippled it in itself, becomes a defeatism of reason after the attempt to change the world miscarried.” However, Adorno's insistence that theory in his time can do nothing other than take the form of critique—“Having broken its pledge to be as one with reality or at the point of realization, philosophy is obliged ruthlessly to criticize itself”—becomes the starting point for Zuidervaart’s social philosophy. The seeds of Zuidervaart’s social philosophy can be found in Reformational philosopher Abraham Kuyper’s notion of the ‘Creational Ordinance.’ As Zuidervaart remarks, Kuyper’s social philosophy offers a “normative vision” and a critique of existing society: “in addition to descriptions and explanations, and in the very process of describing and explaining, we need to evaluate a society’s organization and point out how it can be improved” (253). The main question that Habermas bequeathed us, and later scholars in the tradition of the Frankfurt School have been tackling ever since, regards the normative foundations of critical theory. Zuidervaart, faithful to the first generation of the Frankfurt School, attempts to articulate a social theory that encompasses Adorno’s negative dialectics with the utopian horizon of Marcuse and Habermas. Zuidervaart views creational ordinance as “the notion that the divine Creator has mandated from the very beginning, and continues to mandate, how society should be organized, and that these mandates are given in the very structure of creation” (253). However, according to Zuidervaart, this articulation does not emphasize strongly enough the contradictions in society that gave rise to atrocities and inequality. Zuidervaart’s social theory begins with a descriptive articulation of the macrostructure that encompass the social order (of society). In this he is faithful to Marx’s Das Capital, by employing a descriptive analysis of capitalism that elucidates the normative aspects of what should be the new social order (after capitalism) and turns the analysis into a critique of existing conditions. In this sense, Zuidervaart’s macrostructures are radical concepts that cannot be taken at face value. Zuidervaart’s theory’s categories form a “method”: “a historiographic dialectic between structural differentiation and normative distortion undergirds my own systematic distinctions, and the prospect of interconnected flourishing is the dialectic’s normative horizon” (257). First, Zuidervaart remains faithful to the element of negation in Adorno’s philosophy that refuses any stable articulation of the current conditions as if they are the just and right conditions for all people; second, he insists on the historical aspect of societal conditions, arguing against any acceptance of their normative grounds as the natural progress of society; third, his utopian horizon advances the idea that another version of society could in fact come to fruition—and in that sense he differs from Adorno. While Adorno’s speculative moment of negative dialectics, which also found its voice in the truth-content of art, negates any attempt to convey a positive articulation of a new social order, Zuidervaart, although faithful to Adorno’s negative dialectical impetus, does in fact find instances of positivity in current society that could usher in, if fostered correctly, a new social order. Last, Adorno’s insistence that truth is connected to suffering, and that social theory must give voice to the atrocities of society—“The need to lend a voice to suffering is a condition of all truth”—is rearticulated in Zuidervaart’s focus on the normative deficiencies that expose the contradiction (and thus the suffering) that inequality and unjust society perpetuates. Zuidervaart’s social theory begins with a descriptive articulation of the macrostructure that encompass the social order (of society). The first premise of Zuidervaart’s social theory is that of “interpersonal identity”: “human persons exist in relation to others, and these relations are constitutive of who they are” (257). This is highly important: it is a more formidable subject than the individualistic, unmediated subject. When Zuidervaart forms the subject as part of an interrelation of other subjects, and emphasizes the crucial aspects that the relations have on the formation of the subject, he fully acknowledges that the subject is co-dependent on the social structures that make her the way she is. The entity that Zuidervaart offers us is not an abstract formation of German idealism, nor a passive subject that registers the experience from the object without tainting it, but one that is born out of the intersection between subject and society, as well as the interrelation between macrostructures and their correlative societal principles. Therefore, Zuidervaart’s focus on the macrostructures and societal principles will eventually inform the way the psyche of each individual’s moral compass develops. This is one of his guidelines for future research in social theory. A crude understanding of Marxism often oversimplifies the role of the economy as the main perpetuator of all social inequalities; however, Zuidervaart’s conception of the economy, as well as the polity, bears affinities with the Weberian ideal type. The economy, in this historical epoch, is a “proprietary economy,” led by the pursuit of profit (259). In this sense, the ideal type of proprietary economy sustains the contradiction that rests at the heart of capitalism—the drive for profit fulfills particular capitalists’ narrow interests while neglecting the needs of others, and thus it is not truly universal. And here Zuidervaart’s social theory shines as it brings back the power to push for social transformation to the people, although not in a naïve way. Civil society, an arrangement of people, social groups and institutions, are—as opposed to the proprietary economy and administrative state who have the form of a system that is automatically driven—characterized by being fairly free in spirit, full of spontaneity, which in turn is characterized by the normative and empirical notion of solidarity. We who make up civil society must transform it, and indeed we do so directly and indirectly. Zuidervaart’s articulation of this macrostructure—in a non-pejorative and non-justifying way—highlights the contradictions and tensions that exist in the interaction of these spheres, and at the same time brings forth the way in which these tensions can be pushed to produce a more just society. I would say that civic society and the are the two most important concepts of his social theory. Civic society offers an antidotal economical and social counterpoint since it forms “an economic zone of cooperative, nonprofit, and mutual benefit organizations” (259). Zuidervaart mentions how organic farming nudged the administrative state to take into consideration issues of sustainability and enforce a more conscious way of growing vegetables, and I don’t think it is hard to find other examples of ways in which civic society can affect the propriety economy and the administrative state in order to broaden their interest—even if it is done solely in adherence to some particular interests and not the common good—and change their policies. Zuidervaart forces us to think about the subject of civic society in a more complex way. For example, in a neoliberal economy the privatization of social services into non-profit organizations that administer and fulfill the needs of people, usually in a less-than-optimal way, since they often lack resources and rely on income tests, is obviously an indication of the morally corrupt organization of society. However, Zuidervaart might suggest that in the core of the withdrawal of the administrative state from its obligation to its people lies a sturdy and benevolent notion of solidarity between people in need that grows when times are dire. We should not forget this. Zuidervaart wishes to enforce and fortify the foundations of civic society, as well as this notion of solidarity, to pressure the other spheres to take more robust responsibility for the people under its umbrella. Think for a moment about how relevant this is to the phenomenon of social media. For instance, Facebook and Twitter can be interpreted as symbols of the representation crisis (simply put: people feel their impotence with regard to political change) of current regimes over the world, which influence politicians to form a more responsive approach, thus “reporting” and staying in contact with their citizens via social media (like Zuidervaart I am not suggesting this is perfect situation, but by indicating the tension between spheres a critique of existing condition emerges). Zuidervaart wishes to enforce and fortify the foundations of civic society, as well as this notion of solidarity, to pressure the other spheres to take more robust responsibility for the people under its umbrella. Zuidervaart’s social theory relates to the current third and fourth generations of critical theory, particularly Axel Honneth’s theory of recognition and Rainer Forst’s theory of justification. This is evident in his three societal principles of solidarity, resourcefulness or stewardship, and justice. These three concepts, which serve as the axes of critique of existing conditions and the organization of society, operate as descriptive and normative concepts that, by elaborating on the manifestations that they form in every sphere, can be utilized to expose the inherent contradictions that lie in every sphere in current historical time. According to Zuidervaart, societal principles are “historically emergent, hermeneutically textured, and eschatologically open” (261); thus he retains Adorno’s claim that truth is an endless process wherein an attempt to obtain the object by the concept without being able to exhaust it completely becomes an act that exposes the contradiction in the object and concept, which in turn leads to a re-articulation of the concept. As Zuidervaart weaves these ideal-type critical concepts he stresses their multifaceted nature: in history the meaning of these concepts emerges, thus revealing their mediated and non-natural nature. Simply put: they can change, and in a way demand that we fill them with new content. Furthermore, these concepts require interpretation, since they are specific to time, place, and culture (a form of hermeneutical text). In a way, as Zuidervaart remarks, justice gets its content from people’s real struggles (struggles that need interpretation by social theorists) to voice their needs and sufferings—echoing Forst’s similar claim for justification. Not only does Zuidervaart sustain Adorno’s open dialogue with non-identitarian reason, he retains Adorno’s utopian force in his fidelity to the fulfillment of this concept—being faithful to them. Being “eschatologically open to a future we do not control” (262) means that in the process of interpretation of these concepts we comprehend their openness, as they reflect the contradiction between their ideal-type and their manifestation in reality. To redeem past suffering—another theme from Adorno’s philosophy—we must, by delving into these concepts, leave them open to interpretation. Zuidervaart’s wonderful concepts of “interconnected flourishing” and “life-giving disclosure of society” serve as beacons and as a horizon for critical theorists, who can use them to indicate the discrepancies between the concepts and the miscarried manifestation exemplified in current conditions, as well as to show the way for the emancipation of society. Zuidervaart’s social theory does not reject the idea of social transformation or the emancipation of society, nor does his theory neglect—as do Honneth, Forst and Jaeggi’s—the highly relevant issues that surround anthropocene and non-human entities. Interconnected flourishing involves cats and dogs as much as human beings, and “societal disclosure” encompasses nature as much as human rights (264). Where Zuidervaart sees the “normative deficiencies” that occur in society as a result of the unbalanced affect that each macrostructural sphere have on each other, resulting in a distortion of societal principles, he does not advocate the equal impact of each societal principle in each sphere, but calls for a balanced organic system that allows for a flow between solidarity, resourcefulness, and justice among the spheres of civil society, economy, and polity. Zuidervaart’s social theory does not reject the idea of social transformation or the emancipation of society, nor does his theory neglect—as do Honneth, Forst and Jaeggi’s—the highly relevant issues that surround anthropocene and non-human entities. Because the latter systems are normatively deficient, as is civil society too, pressures have built for civic-sector organizations to take on what these systems fail to provide, such as sustainable sources of energy or universal health care. It would be better for agencies of civil society to call these systems to account than to act as the de facto dumping ground for systemically generated problems (269). In order to compel structural transformation, social theorists must reveal the normative deficiencies in every sphere and thus foster a normative redirection. The macrostructures already hold the germs of the solution to our problems. For example, Zuidervaart points out that within the propriety economy is a hidden social economy, which is ignited by the solidarity factor in civil society (270). The system holds the remedy to its problems within itself, but we must, in Zuidervaart’s words, “strengthen the system’s hidden elements of a social economy through social accounting and voluntary codes of conduct” (272). Current neoliberal economical doctrine that overpowers most countries, and the endless battle that Nordic social democracies have between the right and left political wings, which at time leads to what Nancy Fraser in a recent interview called a decline in social democracy, only demonstrate the crucial aspect of Zuidervaart’s social theory. This demands the strengthening of societal principles in every sphere to reach a proto-harmony that can serve as the basis for the flourishing of society. Zuidervaart’s social theory raises several questions with regard to current predicaments prevalent around the world. He gives the example of art’s role in the civil sphere in juxtaposing and offering an alternative to propriety economics, which are driven by profit and somewhat coercive communication—and perhaps an inherent lack of imagination. This made me think about what art can really do when nationalistic spirits—in Europe and the Middle East, since the rise of neoliberalism and the fall of the Soviet Union—run rampage and suffocate any opposing voices? Furthermore, how far can the sphere of civil society really withstand attacks from other spheres, for instance, when the administrative state withholds funding from art that it finds threatening, thus making it relatively hard to come by, let alone be produced? What can the civil sphere contribute in dictatorial regimes or those that have no prior democratic tradition? I would add that a social psychology or ego social psychology is the next step, and that this will form the microstructures of the architectonic critique of society, thus creating a robust social theory for the future of critical theory that Zuidervaart portrays in this essay. Zuidervaart’s social theory transcends Adorno’s concerns with regard to the normative foundations that allow the social theorist to articulate a social theory in the following way. Zuidervaart inverts the demand for a moral theory to form a social theory that draws its moral and ethical grounds from the concept of the Hegelian ‘ethical life.’ Zuidervaart states: “Unlike Adorno, I do not believe such efforts in solidarity are in short supply,” enticing us to view current partnerships between fellow human beings as a beacon of light that can foster a “global ethic” (274). I find this idea very encouraging, since it rests upon the need to fortify civil society—and by that bring the power back to the people and away from the elites, allowing us to voice our opinion and take hold of our lives, while at the same time pushing the spheres that have to provide for us to do their part—however, I would like to understand how this can help in situations like the war in Syria. Furthermore, Zuidervaart’s critique of Adorno’s insufficient gaze into the subversive elements of current societywhich resist and thwart the ‘wrong life,’ and might even foster a different kind of macrostructure, entailing a just society—informs us that the analysis of the all-encompassing instrumental reason, forged in the fire of self-preservation, is not an adequate representation of social reality. Adorno holds that ‘wrong life cannot be lived rightly,’ and he resists spelling out what a good life and a moral life would be like. The main reason why right living is blocked is that, in Adorno's judgment, ‘late capitalism is evil to the root’ and ‘this evil is particularly grave.’ This is most clearly seen in ‘the moral catastrophe of Auschwitz’ (p. 100). We live in a society where, no matter what we do, our actions implicate us in societal evil: either we inadvertently help maintain the societal system or we directly contribute to it. Swayed by ideologies that shore up the status quo, we become ever more enmeshed in the system, ever less capable of autonomy, of determining for ourselves what is the right thing to do. Because living rightly is virtually impossible, moral philosophy lacks a substantive basis from which to provide an ethical theory. That is why Adorno regards all the moral philosophies on offer as inadequate. A formal Kantian ethics of conviction relies on intentions that either cannot be actualized or lead to disastrous consequences. A more substantive Hegelian ethics of responsibility presupposes a good social fabric and endorses the status quo. Nor would Nietzschean revaluation, existential authenticity, or Aristotelian virtue ethics fare any better. Zuidervaart’s social theory utilizes universalistic concepts that form societal principles: resourcefulness, justice, and solidarity. To refrain from arguing that they are prevalent in society and thus justify existing conditions, these concepts serve as descriptive concepts while he pinpoints to the crevasses in society wherein people do interact and form bonds that solidify these concepts. At the same time, they indicate the areas in society that suffer from a severe lack of these concepts’ antidotal medicine. Why does Zuidervaart use the terminology of the “architectonic” and of “macrostructures?” It is my belief that Zuidervaart wants to illustrate in our minds a certain construct that is not cold, brick-laden, but a living organism that has, like an architectural building, several building blocks, which have an organic and dynamic force in them that must be strengthened and at some point in time awakened—what he calls “calling to account”—in order for us to create a truly right life. Theodor W. Adorno, Negative Dialectics, trans. E.B. Ashton (London and New York: Routledge, 2004), 3. Theodor W. Adorno, Lectures on Negative Dialectics: Fragments of a lecture course 1965/1966, trans. Rodney Livingstone (Cambridge: Polity Press, 2008), 7. Again echoing the final inscription made by Adorno in Minima Moralia, to think reflectively from the “standpoint of redemption” as the world itself has being distorted: “Perspectives must be fashioned that displace and estrange the world, reveal it to be, with its rifts and crevices, as indigent and distorted as it will appear one day in the messianic light.” Adorno, Minima Moralia: Reflections on a Damaged Life, trans. E.F.N. Jephcott (London and New York: Verso, 2005), 247. Lambert Zuidervaart, “Deborah Cook, ed., Theodor Adorno: Key Concepts” (Acumen, 2008). Online in Notre Dame Philosophical Reviews, December 9, 2008. Ben Fulman is an independent scholar. Previously he worked as a research associate at the Centre for Philosophy, Religion and Social Ethics (Institute for Christian Studies). He has a PhD in philosophy and wrote his dissertation about Theodor W. Adorno’s ‘Theory of Experience’. His interests range from social critique, Frankfurt School and critical theory, German philosophy, aesthetics, ontology of objects, and playing the guitar. Currently he is writing a book about Adorno and Hegel’s Theory of Needs. This is a framing of Lambert's social theory that brings to the fore possibilities for social change that move from "the people" toward the proprietary economy and the administrative state rather than the now ubiquitous opposite direction. I confess, I have had a tendency to view Lambert's theory in fairly encyclopedic terms, as a speculative mapping out of the terrain so to speak. Of course in such an encyclopedic reading even the dynamic elements of the picture Lambert is drawing come to take on a structural and hence static cast. Your praxis oriented presentation, Ben, really sets the picture in motion and allows one to use the fine descriptive detail, the dynamisms inhering structural states of affairs or perhaps better the structured character of its dynamisms to begin to map out historical configurations of civil society that have affected in palpable ways the intersection of Lambert's three macrostructures and imagine others that could do so in the future. This in turn allows one to look unflinching on the Webberian elements that gave rise to his notion of the "iron cage" without feeling trapped, without feeling defeated as if there is nothing "we" can do anymore to strive toward a more just, stewardly and communal living-in-the-world. One can see so much more clearly on your reading how Lambert's theoretical labours ever emerge from the conundrums of ordinary living and with an eye to blessing it by supporting in their way the work of human flourishing. For that gift, Ben, I owe you my thanks.